Do I Need New Car Brakes? Following on from our previous post examining how to know when your clutch needs replacing, we detail the tells that will let you know your brakes are on the out. When Do My Brakes Need Replacing? Sitting comfortably in your car, soothing tunes on the radio, it can be easy to forget that the engine beneath you requires regular and routine care and attention. Alongside the tyres, the brakes are the most important safety feature your pride and joy has. It’s absolutely imperative that they are well maintained; they are the only thing capable of stopping you if something unexpected happens. Nobody wants to be in an emergency stop situation knowing that their brakes aren’t in tip top condition. Routine maintenance, along with regular servicing is essential in ensuring the roadworthiness of your vehicle and the safety of its passengers. 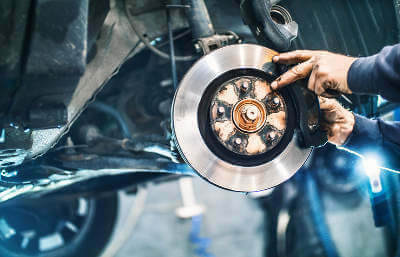 Maintaining your brakes needn’t be a costly affair, with timely and regular upkeep, your brakes can be held in good condition for a relatively modest amount. MyCarNeedsA.com can provide convenient quotes in your local area. But How Do I Know There Is Something Wrong With My Brakes? There are various warning signs to look out for when it comes to your car’s brakes. Below, you’ll find a checklist of the main safety points and warning signals to watch out for. Knowledge is power, especially when it comes to keeping you and your family safe. Increased stopping distance:If you have noticed it takes you a much greater distance to stop, it is definitely time to book your car in to be inspected by a specialist. This is the most obvious sign of failing brakes and yet, surprisingly, the most ignored. Brake warning light on the dash.If the brake light is illuminated on your dashboard, your car is warning you that something is wrong. Take it to be inspected as a matter of urgency. Listen carefully to the sounds the car makes. Each journey, turn off the stereo and take note of what you can hear. Noises to listen out for are squealing, grinding or a metallic sound, when braking. All of these are warning signs that the pads are wearing down and need replacement. Prompt replacement of brake pads prevents the need for new brake discs. Listening to your car may help you catch it in time and save you money in the long run. Is your car pulling to one side? Amongst other things, this can be an indicator of brake issues, unevenly inflated tyres or misaligned wheels. If you notice this, it is time to have your car checked over to be sure you and your passengers are safe. Vibration on the pedal. If you can feel vibrations (noticeable, unusual vibrations) on the pedal, when braking, have the car checked over. This can be a sign of serious misalignment of the brakes, the results of which could be fairly catastrophic. Soft brake pedal. If the brake pedal goes closer to the floor than it ever has and feels squishy and lacking of resistance, you should have your brakes checked. Here at MyCarNeedsA.com, we can provide quick quotes for all types of car repairs, routine and specialist maintenance work, servicing and MOTs. Our reliable and trusted partners are part of our approved network and work tirelessly to provide high levels of customer satisfaction at competitive prices.